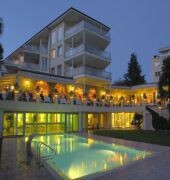 The much-acclaimed Hotel Eden Roc stands out for its spaciousness, attention to detail and unrivaled location on tranquil Lake Maggiore. Thanks to its idyllic climate, the hotel creates a small paradise for guests, where they will find an impressive reception area, the work of Swiss interior designer Carlo Rampazzi. 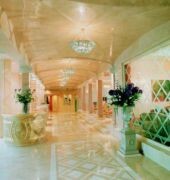 Gleaming marble floors beneath a gently arching palazzo ceiling with antique Italian chandeliers and inviting settees turn the lobby into the central point of the two buildings making up the hotel. 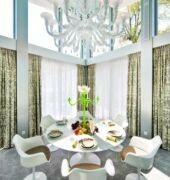 One wing features rooms designed by Rampazzi, using his signature lively color combinations, striking shapes and widely varying materials. The other offers accommodations that are more restrained in design. Every room has at least one balcony on which to soak up the Ticino sun.